Isaac and Miria cameo in this week's episode of DRRR!! Pretty awesome, even though they didn't show up in the book. Shoulda had Elmer, Denkuro and Nile somewhere in there too. 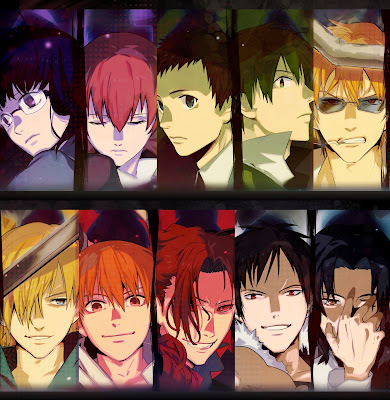 I know I've seen the one next to Izaya, I'm guessing he's a homonculus from Baccano. Following the pattern, I'm guessing he's from Durarara? "Following the pattern, I'm guessing the other ?? is from Durarara?"